A girl living in Santa Barbara who finds joy in the kitchen, traveling the world, beautiful interiors, beauty, art and fashion! Salsa is a staple in my life, especially when I am trying to live a healthier manner. Salsa is good to me even when I am in the mindset of eating whatever the heck I want, so I eat it while I’m being healthy and I don’t feel deprived! The amazing thing about salsa is that it is guiltless and makes everything THAT much better. If I am eating vegetables, you better believe I douse it in salsa. Pretty much everything is an opportunity for me to eat salsa! I have always been a red salsa girl; the tomato, cilantro, onion, jalapeño, and lime combo is my go-to jam. Today I wanted to switch it up and get out of my usual comfort routine, so I bought every green chili I could find in the grocery store. The results were stellar and just absolutely beyond mouth watering, and – guess what – SO healthy! Since I am on a health train extreme, I home made cashew cheese, and let me tell you SUPER good! 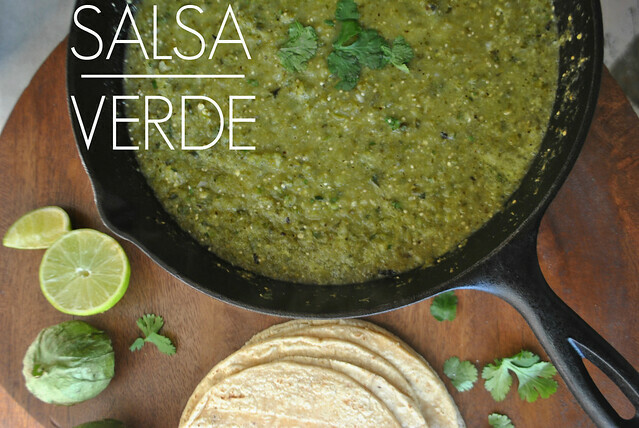 I used fresh corn tortillas, cashew cheese, and this green salsa, and it was to good to be true! Vegan and gluten free! If you are interested in getting the cashew cheese recipe, let me know in a comment!